HUGE EXOPLANET NEWS ITEMS: PICTURES!!! This is incredible: For the first time, ever, astronomers have captured an optical image of a planet orbiting a star like our own. And that’s not all: we also have a second picture showing TWO planets orbiting a second star! Do you see it? That tiny spark, that wee blip of light? It may not look like much, but it is in fact a normal planet orbiting a normal star, 250 trillion kilometers from Earth. The picture as a whole needs some splainin’. The star in question is Fomalhaut, a star easily visible to the unaided eye; it’s the brightest star in the constellation of Piscis Austrinus, the 18th brightest in the sky, and only 25 light years away. It’s literally millions of times brighter than the planet, so the Hubble camera uses an occulting bar, a small piece of metal that blocks the brightest part of the star’s image. The blacked-out area in the center of the picture is where Fomalhaut is (also, the star’s image has been digitally subtracted using an image of another star as a template; that further reduces the amount of unwanted light). The radial lines are not real; they are an optical effect of the very bright star. The ring is real; it’s dust leftover from the formation of the star and the planet. In fact, the thinness of the ring was a big factor in assuming a planet was lurking there; the planet’s gravity sculpts the ring, keeping it narrowly confined. Also, the ring is off-center from the star, and a planet in an elliptical orbit would explain that nicely. The planet itself is just that small dot, almost lost in the noise from the star and the light from the ring. I’ll be honest; had I been analyzing the image, I might have missed it at first. But it’s there, and it’s real. Images taken almost two years apart show that the planet is moving with the star, and is consistent with it orbiting Fomalhaut at a distance of about 18 billion km (11 billion miles). That’s four times the distance of Neptune from the Sun. It takes 872 years to make one complete orbit. The mass is not easy to determine, and is estimated using its effect on the ring; it’s likely to be about the same size and mass as Jupiter. The planet is unnamed, and is simply called Fomalhaut b.
I am reeling from this image. Years ago, when I still worked on Hubble, I did some work on planetary debris rings like this, including seeing if we could directly see planets near stars. The amount of work that goes into this type of discovery is phenomenal, and so I’m stunned by the success of it. That image is the first to directly show two planets orbiting another star! It’s a near-infrared image using the giant Gemini North 8 meter telescope. Like in the Hubble image, the star’s light has been blocked, allowing the two planets to be seen (labeled b and c). So there it is. The first ever family portrait of a planetary system. One thing that makes these particular planets a bit easier to find than usual is that they are young; HR 8799 and its children are only about 60 million years old. That means the planets are still glowing from the leftover heat of their formation, and that adds to their brightness. Eventually (in millions of years), as they cool, they will glow only by reflected light from the star, and be far harder to see. Fomalhaut b, in the Hubble image, is much older (200 million years), and glows only by reflected light from Fomalhaut. If it were much smaller or dimmer (or closer to the blinding light of the star), we wouldn’t have been able to see it at all. These images were basically science fiction just a few years ago. Now they are fact. We have an optical picture of a planet orbiting another sun-like star, and a picture of two planets orbiting another star. OK, now that you have the news, a few caveats. We now know of more than 300 planets orbiting other stars. And a planet has been imaged before, but it was orbiting a brown dwarf, which is different than a normal star like the Sun. Brown dwarfs are so-called "failed stars", much smaller than the Sun. 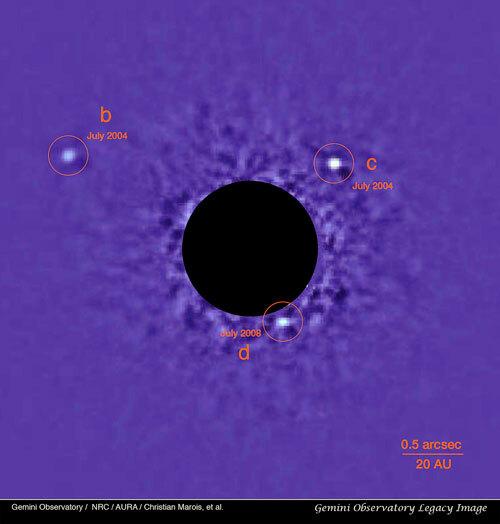 Another possible planet orbiting a sun-like star has been imaged, but has not yet been confirmed. So these images here really are firsts. They are history. I still can hardly believe it, and I worked on data like this! Yet there they are, proof that our planetary system is not the only one in the Universe. We knew this already; indirect evidence confirms planets and even multiple planetary systems around many nearby stars. But there’s nothing like a picture. There, with your own eyes, you can see for yourself that other planets exist. They are not Earthlike, not even a little… they are massive, young, hot planets that are probably mostly gaseous and completely inhospitable. In a few years, we’ll have more pictures like these. And we’ll get better. Our telescopes will get bigger, our equipment more sensitive, our techniques improved as we understand their capabilities. And the pictures of other planets will roll in. How long before we see the Holy Grail, the first image of a terrestrial planet, orbiting a star like the Sun at just the right distance for liquid water to bathe its surface? It may not be for a decade or two, but mark my words: that day will arrive. And when it does, well, we’ll just have to rewrite the history books again, won’t we?